Dr. Steven G. Driese obtained his B.S. degree in Geology from Southern Illinois University in 1977, and M.S and Ph.D. degrees from the University of Wisconsin-Madison, in 1979 and 1982, respectively. 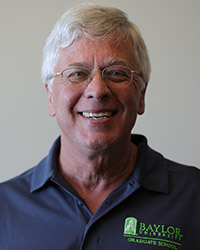 Driese was previously a faculty member at the University of Tennessee-Knoxville from 1982-2004, and from 2004-2013 was Professor and Chair of the Department of Geology at Baylor University. He is currently a Professor in the recently renamed Department of Geosciences and was appointed Associate Dean for Research in the Graduate School in 2016. Driese teaches Graduate-level courses in Paleopedology, Soil and Paleosol Micromorphology, Sandstone Petrology, and a Seminar in Grant-Writing at Baylor University. Driese’s current research emphasizes paleoclimate and paleolandscape reconstructions derived from the study of paleosols. His research includes studies of Precambrian paleoweathering surfaces, Paleozoic paleosols of the Appalachian basin of the eastern U.S., modern Vertisols (high clay content soils with a high shrink-swell potential) occurring in the Texas Coast Prairie and Blacklands, and Quaternary floodplain soils, paleosols, Quaternary paleosols of Costa Rica, and Miocene and Quaternary paleosols of Kenya and Uganda. Driese lead an SEPM-NSF Joint Workshop on Paleosols and Modern Surface Soil Analog Systems from September 21-25, 2010, at Petrified Forest National Park in Arizona, and co-edited an SEPM Special Publication #104 (2013) containing papers presented at that workshop. With over 150 published peer-reviewed papers and 285 abstracts presented at professional meetings, Driese has had his research funded by the National Science Foundation and by the American Chemical Society (Petroleum Research Fund). He served as an Associate Editor for the Journal of Sedimentary Research, was on the Editorial Board of Geology, Sedimentary Geology and PALAIOS, and is currently on the Editorial Board of Palaeogeography, Palaeoclimatology, Palaeoecology. Driese previously mentored 25 Graduate students at the University of Tennessee-Knoxville, 10 graduate students at Baylor University (9 Ph.D. and 1 M.S. ), and is currently mentoring 3 Ph.D. students. Driese has been a member of the Society for Sedimentary Geology (SEPM) national organization, since 1977, served as Secretary-Treasurer of SEPM from 1994-1996, and then as President-Elect (2008-2009) and President (2009-2010). He has been a Geological Society of America (GSA) Member since 1989, was elected a GSA Fellow in 1998, and was GSA representative to the US National Committee on Soil Science (USNC/SS). Driese has been a member of the International Association of Sedimentologists (IAS) since 1985, a member of the Soil Science Society of America (SSSA) since 2001, a member of the Geochemical Society since 2012, and a member of the National Association of Geoscience Teachers since 1985. Driese also recently served on review panels for the Critical Zone Observatory (CZO) program funded by the NSF Geosciences Directorate, for the NSF Graduate Research Fellowship (NSF GRFP) program, and most recently (April-July 2017) served on the Committee of Visitors (COV) reviewing the entire Earth Sciences Program (EAR) of the Geosciences Directorate of NSF. Driese was elected a Fellow of the American Association for the Advancement of Science (AAAS) in November of 2012 and was awarded Honorary Membership by the Society for Sedimentary Geology (SEPM) in June of 2015. Driese is a Past Chair of the Soils and Soil Processes Division of GSA, and recently served three years on the Joint Technical Program Committee (JTPC) for the GSA Annual Meeting.